Most readers of this blog are well aware that July is Oregon Craft Beer Month. If you didn't know that, shift your eyes to the top of the left column. See the graphic? Alrighty then. You're on board! I think I need not mention that July is a packed with beer events. There's barely a free moment for beer lovers. Last year we were talking about event fatigue by mid-July. This year, I think we've gotten used to the idea. Bring on the warm weather and festivals! 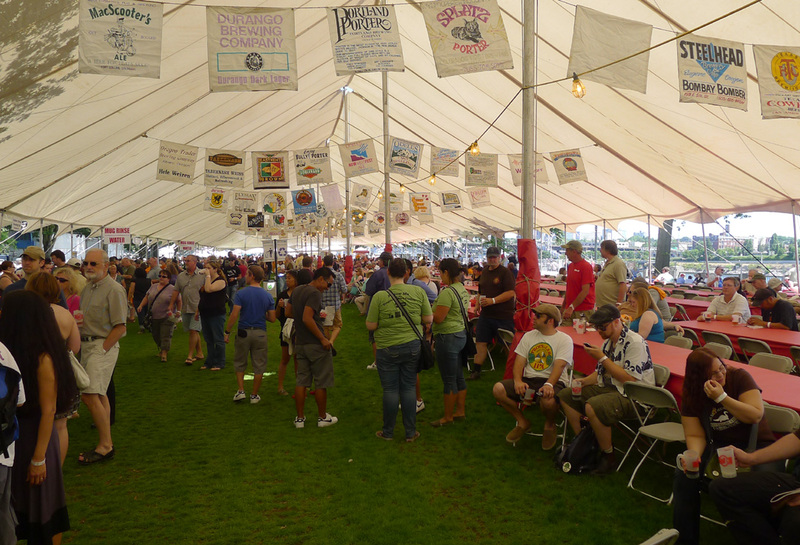 The culminating event of Craft Beer Month is the Oregon Brewers Festival, which marks it's 25th year in 2012. This year's event will happen July 26-29 in Waterfront Park. 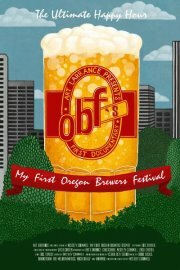 The OBF is the quintessential beer event not only of the month or summer, but of the year. More than 80,000 beer fans will descend on Waterfront Park for this year's event, which showcases craft beer from Oregon and beyond. More than $20 million will be injected into the local economy as a result. There's no better event here. Period. 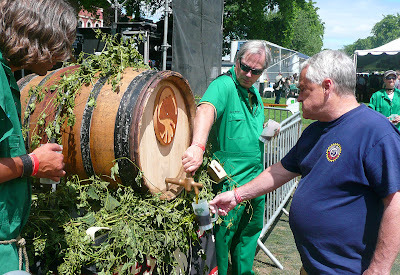 Last week, I was fortunate enough to be invited to attend the premiere of the movie, My First Oregon Brewers Festival. I'll get to the movie shortly. First, you need to know it was commissioned and presented by Art Larrance, co-founder of the OBF and Portland Brewing back in the day. Besides the festival, Art also operates the Raccoon Lodge in Raleigh Hills and the Cascade Barrel House in Southeast Portland. He is one the founding fathers of the craft beer industry in Portland. Events like this are great fun. 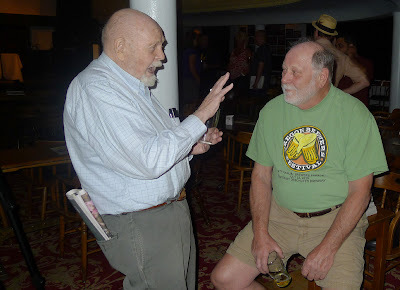 You get to mingle with the legends of craft beer. I spent 20 minutes talking to Fred Eckhardt about his World War II military service as a Marine. Then Art launched into a discussion of his service during the Vietnam era. These guys obviously love great beer, but maybe more than anything else they are great story tellers. You gotta love hanging out with them. As for the movie, it is not my cup of tea. Or maybe I should say it isn't the movie I, personally, would have made. Art told me point blank he was happy with it...which is cool. The pacing, content and editing suggests it was made mostly for young folks who have yet to attend an Oregon Brewers Festival. As a promotional vehicle, that makes sense. As an historical vehicle, it doesn't work...despite interviews with many key people. Beth Harrington's wonderful OPB documentary, Beervana, is a better place to start if you want some historical perspective on the early days of craft beer in Oregon. Just saying. Prior to the movie screening, there was a panel discussion moderated by John Foyston (subbing for Lisa "The Beer Goddess" Morrison, who was ill). 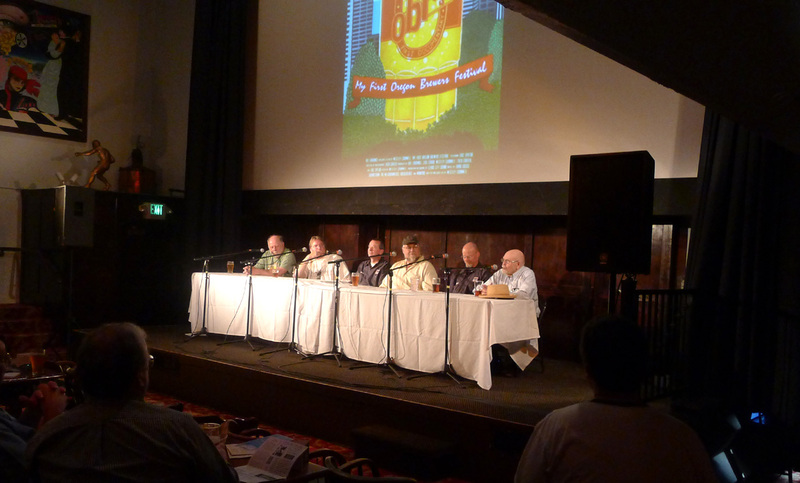 Panelists included Larrance, Eckhardt, Kurt and Rob Widmer, and Karl Ockert (with Bridgeport during the first OBF). John got things going with some general questions and eventually took questions from the audience. It's instructive to consider what these guys were thinking at that first festival in1988. They were desperately looking for a way to promote what they were doing. At the time, there was no calendar of events featuring craft beer. Indeed, there was nothing. These guys had no idea if their fledgling breweries were going to make it or not. An outdoor beer festival in the summertime seemed like a good promotional idea. 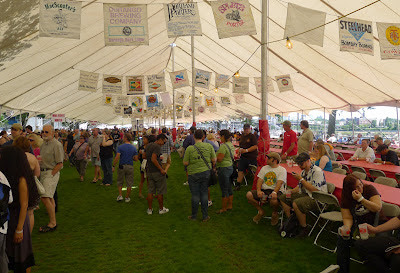 There were 22 breweries and a single tent that first year. They planned for 5,000 beer fans over 2 days. When three times that number flooded the grounds, logistical issues cropped up. For starters, they didn't have enough beer. To keep the taps flowing, the co-founding breweries (Bridgeport, Portland Brewing and Widmer) exhausted everything they had, There were evidently quite a few guest taps around town the week after the festival. But a star was born. Why has the OBF flourished over the years? There are many answers to that question. The event happens in the same location and at the same time every year. It's highly visible. The weather is almost always excellent for beer drinking. Finally, the OBF remains a reasonably affordable event. For $20, you can taste great beers in a terrific spot for an afternoon. Does it get an better? The most legitimate question of the evening came from someone behind me, who asked about the future of the OBF. It's a fair question...the elephant in the living room. It's plain to see what the festival has been for its first 25 years, how much its grown and what it has done for craft beer. What do the next 25 years look like? Larrance answered the question nimbly. He intends to do the festival for another 7-8 years. Although he would like to see it grow, there are obstacles. The permit they have for Waterfront Park is for the space between the Morrison and Burnside bridges. Because of other summer events, he does not believe it will be possible to expand the space. The most readily available option is to add days. Look, to a great extent, the OBF as it exists today is the vision of Larrance and the team he has assembled. The event isn't going to change much as long as Art sticks around. It may or may not change when he steps away. It all depends on who takes over. If his daughter Alissa or someone on the current team takes over, the OBF is likely to stay much as it has been. If an outsider takes over, all bets are off. Looking ahead, you have to assume the OBF will get bigger. You've got a world class event that parks a significant amount of money in the Oregon economy. And it supports a growing industry that brings even more economic benefits to the state. Why wouldn't you want to expand it? Why wouldn't the City of Portland want to get behind expanding it? My thoughts? I think slowly expanding the number of days makes great sense. You can't instantly go to five days or you will simply spread your existing attendance out. The key is going to be getting the word out to the world, since that's who you're inviting. Once you fill the park for four days, expand to five. Pretty soon you may have the thing starting on Monday instead of Thursday. Then you can start talking to the city about expanding the space. Could this wind up being an Oktoberfest-like event? You never know. Anyway, here's to Oregon Craft Beer Month and another great Oregon Brewers Festival. I'll have more to say about his year's event in coming weeks. Hey Pete, the video was indeed meant as a promotional piece for the festival, not as a documentary of the past 25 years. In fact, it was commissioned to create a 5 minute video we could put on the website for new guests; when we had way more footage, we decided to go with it! Hence the title "My First Oregon Brewers Festival." Cheers!